Concrete countertops, unlike other countertop materials, offers complete customization, making it a great choice for those who want to choose the colors, finish, size and shape. The cost of concrete countertops will depend on a variety of factors, including the customization process (how many details are going into the project), the design, the construction, shipping (if required), your geographical location and the contractor you decide to hire. Since these countertops will always be custom-made to your specifications and often will require a specialized designer or architect, the price can be quite high due to the special details, unique designs, installation, and transportation required, not just the concrete material. 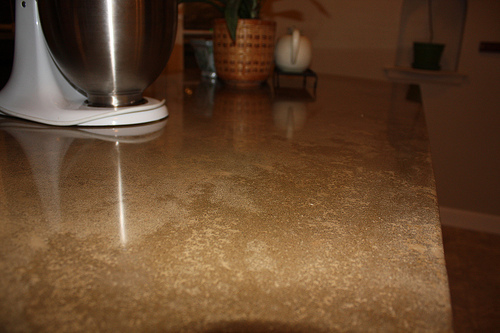 For the costs of a standard 1.5-inch thick concrete countertop, again, based on the factors mentioned above, the costs for just the materials and design can cost $65 to $150 per square foot, while the labor can be an additional $4 to $13 per square foot, all depending on your location, bringing the grand total to $69 to $163 per square foot. The amount of time it takes to create your countertops, again, will all depend on the customization of your project. The professional installation, again, depending on the job size, can take about 10 to 12 hours for every 100 square feet of concrete countertops, but it could take much longer if you need customized edges and/or thicker-than-average concrete slabs, to name a few. As you can see, there are multiple factors that can affect the total price, and for that reason, we highly recommend you use the free quote comparison tool, HomeAdvisor.com. With this tool, you can explain your job and with this information, contractors will contact you, for free, with the quotes they would charge for your specific job. No credit card is needed, it’s fast and extremely easy to use. Irregular or curved shapes: Unlike a slab of granite that is already pre-determined, concrete countertops need to be poured and created to your specific size. In the case of longer-than-average seams, odd shapes or a heavier slab, these factors can greatly affect the total cost. For example, a precast countertop often needs to be shipped to your home, and as you can imagine, the weight can be quite heavy, often being too heavy for shipping purposes. What this means that if your concrete slab was too heavy, then it could affect the structural sound of the counters and could cause weight-bearing issues. As for counters poured on site, if it will require a seam due to the size, then a joint will need to be installed in order to handle the potential cracking in the future, and the seam will need to be disguised so it’s not visible from a distance. Thicker-than-average concrete counters: The standard concrete counter will often be 1.5 inches thick; however, this doesn’t mean your counters have to be this “thin.” While thicker counters are doable, if desired, it can create more work for your contractor due to the weight and the work involved. Do keep in mind, however, that the entire countertop will not be as thick as you want it as the front of the counter will appear to be the thickness of your choice, while the back of the counter, not visible to the eye, will be the standard 1.5 inches thick. Integral drainboards and/or trivets: While optional, drainboards can be added to your concrete countertops, an option which is designed to accommodate fruits or vegetables, for instance. When installed, it allows the water to run off of the countertop directly into the sink and are simply slats that are cast into the countertop during the design-making process. Trivets, another optional add-on, are raised metal rods that are designed to withstand any heat from pots and pans. Each option can add a few hundred dollars. Customized edges: Adding an edge to your countertop can create the biggest difference in terms of aesthetic purposes, but again, like the drainboards and trivets, this is yet another option to consider which can increase the price. Edge details can offer a nicer finished look, and with a variety of forms and design options available, choosing this option can increase your install price. Backsplashes: A backsplash, made of concrete, can be added as well, offering yet another unique look to your kitchen. Combining the same materials to essentially extend your concrete countertop, the backsplash can be made from more than just concrete as you can add glass tiles or stones, to name a few. Staining: After the concrete cures for about 10 to 14 days, you can then choose to stain if you decide to do so. With endless options and designs, this can add an additional $2 to $15+ per square foot, as mentioned in the table above. Adding or mixing additional colors, such as white, can add to the price as well. Shipping costs: If your contractor chooses to create the concrete counters outside of the install location, then shipping may need to be considered depending on the contractor’s billing policy. According to the ConcreteNetwork.com, the concrete countertops can either be made on site or built in a climate-controlled shop. In the case of building the counters inside of a shop, contractors will use special casting tables, where they can cure and seal the concrete according to size, all while inside an area where conditions are controlled. For those who want to build on site, the website notes that many contractors prefer to do this as they can form the countertop according to the customer’s request such as creating curved corners or special edges, to name a few. The countertops, depending on the contractor, will almost always be made of cement, lightweight aggregates, and a combination of additives such as acrylic, fiber reinforcement or silica fume pozzolan, for example. Aside from this, one or more types of reinforcement will also be used such as fiberglass, some fibers, wire mesh and/or structural steel, again, depending upon the contractor’s preference. All countertops will be cured and some will be grounded, often with a diamond polishing stone to help grind the surface skin in order to make the countertop stronger and prettier to the eye. Lastly, all concrete countertops will always be sealed, but the type of sealing method, just like the steps mentioned prior, will depend on the contractor’s preference. For some, an epoxy sealer will often be used, especially for concrete counters used in the kitchen, since it’s known to be harder than concrete and is often an inexpensive option for the buyer. Which is cheaper? In comparison to granite, concrete countertops can often be up to 75 percent more due to the installation process and work involved. As for customization, granite slabs do offer an array of options, but if you want true customization, in terms of designs, size and look, then concrete can often be considered the winner, essentially offering you an endless choice of options. Concrete can be just as durable as granite, but it is prone to cracking while it dries, especially if it was not installed properly. In the end, it will depend on the pour, the mixture and how it was poured, but effectively, granite may edge out concrete in terms of durability in the future, but not by much. Both granite and concrete will both require a pinch of upkeep as each will need to be sealed to prevent any water or oil from seeping through. Failing to do so can lead to concrete mold, for example, while granite counters can start to lose its luster if not taken care of properly. Granite has held its value over time, appealing to many buyers, while concrete counters can often be viewed as “trendy” and not as attractive to those looking to buy. To be safe, many experts advise you choose granite if you want a better resale value. One of the major reasons to choose concrete counters is its aesthetic value. Countertopguides.com tells us you shouldn’t picture a sidewalk on your counter, but rather, you should picture a granite-like counter once you stain it to revolutionize its appearance. Unlimited color and styling options. If you can picture it, you can create it. Hard and tough, concrete counters will stand the test of time, no matter how busy your kitchen is. It is scratch resistant and can handle heat. For some, it can be quite costly when compared to other counter types. The maintenance schedule can be a turn off for some owners as it will need to be resealed at least every year or so to keep it from staining. Concrete, just like your driveway or sidewalk, can, unfortunately, crack, especially if it was poured in place.